Oral care. It seems like a simple enough habit to manage right? At most it takes 10 minutes out of your day and ensures many things that any normal person would want. Not only are you avoiding the myriad cases of dental disease, but your regular eating habits aren’t interrupted. However, as you get older, it can be easy to lose sight of your oral care routine. Your dentist in North Valleys is all too familiar with patients like this. Of course, he doesn’t want to make them feel guilty. That’s why he’s offering a few tips to make sure you’re protected in the future. Many people don’t realize that oral care and diet come hand and hand. 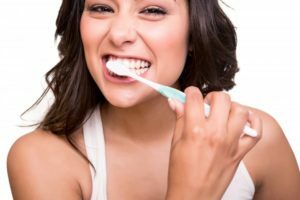 Diet can dramatically influence how often you should be brushing and the amount you brush just might determine what you’re able to eat and drink. Science says that eating a balanced meal and snacking less throughout the day is actually better for your oral health overall. This is because balanced meals are more effective at producing saliva, which works well to remove food debris and bacteria from your mouth. When building your meals, make sure they are varied and include foods that promote gum health and healthy teeth. Green tea, bell peppers, and citrus fruits contain vitamin C which acts as an anti-inflammatory, while dairy products contain calcium, which is good for strengthening bone. The best oral care routine combines regular brushing and flossing. To prevent tooth decay and gingivitis, use a fluoridated toothpaste to brush twice a day and floss once a day, ideally before bed. This way, food debris and bacteria doesn’t fester in your mouth while you sleep. For additional protection, consider adding a fluoridated mouthwash to strengthen your existing tooth enamel and provide an additional varnish on the surface of your teeth. Use tooth whitening once to twice a week to remove surface stains and keep teeth white. Don’t be afraid to buy flossing aids such as floss picks or a handheld floss holder as well. Seeing your dentist every six months is incredibly important to your preventive care, according to your North Valleys dentist. Not only can they provide a better cleaning than you can at home, but they can catch early signs of decay and gum disease that the naked eye can’t. Furthermore, oral cancer and other abnormalities can be caught early and treated more effectively if done so. Want to learn more quick tips for preventing tooth decay, gingivitis, and other more serious diseases? Schedule an appointment with your dentist in North Valleys; you’ll be glad you did! Dr. Josh Branco earned his dental degree from Boston University’s dental school and completed his post gradual General Practice Residency at UNR School of Medicine. His passion has always been to help patients find the best treatment available and improve their quality of life, so you can feel safe and confident having your professional care in his hands. To learn more about his preventive treatments and practice, contact him at (775) 677-0790 or visit his website.